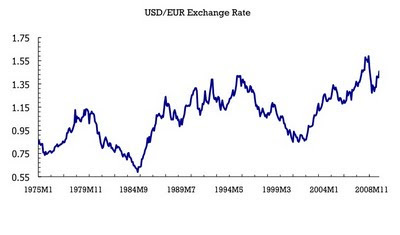 As a technical and historical explanation of the chart: this is the nominal exchange rate between the US dollar and the Euro (before 1999 the German Mark is used as the Euro) and the upward trend is a reflection of the differences in inflation between Europe/Germany and the US. But even if we were to correct for inflation differences, the US dollar is still weak by historical standards. Also notice that some of the waves that we see were reversed by some statement coming from central banks and government officials, such as the September 1985 Plaza Accord, the February 1987 Louvre Accord and the interventions of November 2000. By historical standards, we would have expected similar statements in 2008 when the US dollar reached the 1.60 USD/EUR level. We did hear some comments about “excessive volatility” but not about the actual value of the currency. 2. Related to the point above, but more from a theoretical point of view: how much do we want to introduce price distortions (changes in relative prices via changes in the exchange rate) to ensure that the spending patterns of different countries are sustainable? The textbook logic of currency depreciations to smooth recessions is one that applies to countries that are suffering an asymmetric shock. Today we face a global recession, so according to the textbook, most advanced economies need an exchange rate depreciation. We might argue that all these currencies need to depreciate relative to countries that are doing well (China and other emerging markets) but we cannot simply argue that the US dollar has to get weaker. It is interesting how many criticisms China has gotten for “manipulating” the value of its currency to affect economic outcomes and now we are willing to argue that the US should be doing something similar. Just to be clear, I am not arguing that currencies cannot be a good adjustment mechanism, but the context matters and one needs to be explicit about the difference between an asymmetric recession and a global recession and the difference between smoothing business cycles and addressing structural imbalances. 3. The perspective of the other countries. A weak dollar can help the US increase its exports, which goes in the direction of reducing the current account deficit, but why would other countries see this as a “return to equilibrium”? Wolfgang Munchau argues that “A strong Euro would nicely take care of of Germany’s persistent current account surplus”. I am not sure all the Germans agree with this statement. I am also not sure that a fall in revenues (i.e. fall in German exports) would lead to a decrease in the saving rates in Germany. It might lead to the opposite behavior – an increase in saving rates because the decrease in income leads to more uncertainty and precautionary savings (which will make the current account surplus even larger not smaller). Note: originally published by Antonio Fatas at the blog Antonio Fatas and Ilian Mihov on the Global Economy.